Cabinets set the tone and lay the foundation for your kitchen. Because of this, it is important choose both layout and style to make the most of your kitchen’s form and function. Typically, base cabinets are the workhorses of the kitchen as hanging upper cabinets give way to windows, artistic backsplashes, hoods, and other style features designed to create living space appeal. Today’s lower cabinets are also trending from classic door cabinetry to more functional drawers that allow for easy access and organization. Hanging wall cabinets have been extended to the ceiling in many modern kitchens to provide additional storage space with style for kitchenware is only used on occasion. Other kitchens utilize floor to ceiling cabinetry to create accent walls that houses cookware, appliances, and more. 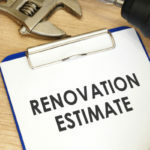 Particle board is out for today’s kitchens, as is the melamine of yesteryear, making way for plywood which delivers long life and durability for busy lifestyles. Cherry is the favored wood choice for kitchen cabinets followed by bamboo and mahogany. Textured wood cabinets are rising in popularity for their natural look and appeal. There is more to choosing your kitchen cabinets than just the cabinets. The hardware and countertop selection are a crucial part of you overall kitchen style. In the hardware department, some of the most recent trends include soft-close drawers and doors. This accessory is a must have and can be found as an included feature on some hinges and an add-on with others. Along this line and in tune with touchless technology – watch for touchless cabinets to be the next big thing in kitchen cabinetry. Waste and recycling drawers are a must have feature in today’s kitchens. When selecting your hardware, choose a style that complements your cabinet choices, but isn’t so fashion forward that you will fall out of love with it quickly. When choosing door hardware, it’s important to select adjustable door hardware, which keeps doors uniformly placed. You will also want to choose valances and recessed bottoms to conceal under-cabinet lighting fixtures. To make sure there is no dead space in the back of corner cabinets, chose Lazy Susan which spins around bringing items directly to you or a pie corner base cabinet that pulls out like a drawer and puts your kitchen wares within reach. Finally, keep in mind that you don’t have to go all in for custom luxury cabinets to gain all these premium features for your kitchen. Priced in the mid-range, semi-custom cabinets deliver lots of organization features just like the higher priced luxury styles. 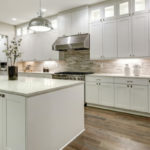 Kitchen countertops add the finishing touch to your kitchen cabinets, so you want to chose materials and a design that is a reflection of your style, but also delivers outstanding function for your kitchen. 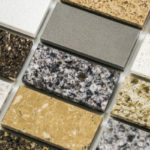 Currently granite is still the top choice in kitchen countertops offering a variety of colors, patterns, and thicknesses. 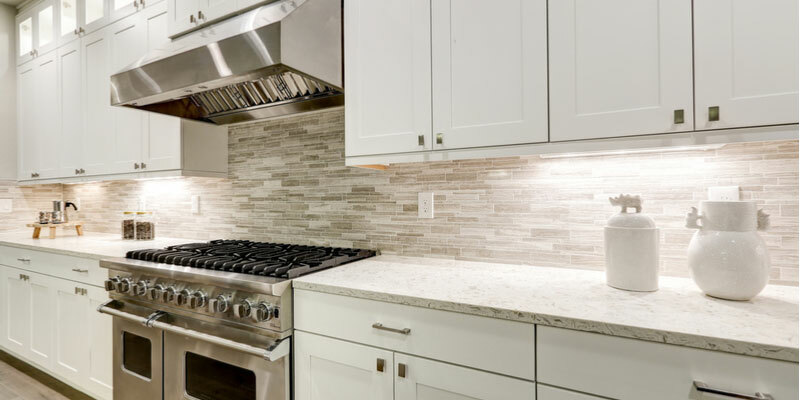 Quartz surfaces are gaining ground in popularity in the form of engineered stone (93 percent quartz particles) and delivering scratch resistance, stain resistance, durability as well as a sleek aesthetic for the kitchen. Concrete is also gaining ground in kitchen design because of its optional colors and durability. Concrete counters can also be cast and poured to suit any countertops shape – onsite or offsite. Crushed glass accents are making their way into countertop style as well presenting a splash of color and a lavish focal point. 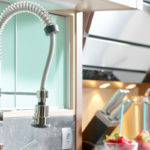 Stainless steel is another trending option with its sleek industrial-strength finish, though with its higher than average cost it is often used as an accent or focal point.